San Francisco’s Bi-Rite Market, opened in its current incarnation in 1997, is one of the most thoughtful and enjoyable grocery stores in the Bay Area, and my hands-down favorite for shopping and browsing. 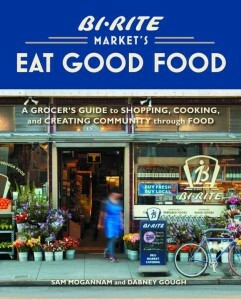 Bi-Rite’s new book, Eat Good Food, is an accessible, concise and beautifully photographed primer for the home cook. It provides well-curated and informative recommendations on how to create a sustainable, healthy kitchen, with recipes to inspire. It is a perfect extension of Bi-Rite’s foundational philosophy: creating community through food. This is a grocery store that prides itself on operating like a restaurant, made evident by its attention to detail when it comes to food and service. It doesn’t come as a surprise that the emphasis throughout this book is on how quality and simplicity of ingredients make for better home cooking. But the book, and the market, take things a step further, piecing together stories that illustrate the importance of how food is produced, and how to prioritize practices and farmers that create a healthier food system. Focusing on themes like “How to Use,”How to Store,” and “How to Buy,” the book’s chapters are organized much like any market you would encounter: the deli case, the produce department, dry goods. I imagine this book serving as my go-to for remembering which type of flour works best for what purpose, the difference between salt-packed and oil-packed anchovies (remember how much I love anchovies?) and how to make informed food choices in any grocery store. The recipes, interspersed throughout the chapters, are inviting, diverse, seasonally inspired, and for the most part, simple enough for any home chef to tackle. I selected one of the Winter recipes to try because it is a creative version of a family staple: chicken soup. It also reminded me to step out of our usual routine and try something new. My plan was to start with a familiar food, a sure thing, and take it up a notch by adding unexpected ingredients. Worst case, I assumed they would pull out the additions and stick with the basics. 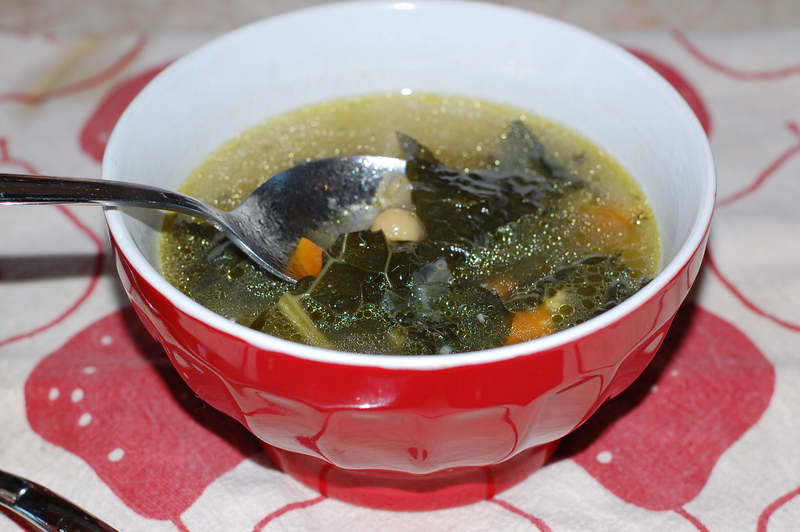 But it turned out to be a best case sort of evening: this soup was a total hit! Optional: Several handfuls of croutons, 1 -2 cups cooked brown rice, etc. Note: The vegetable amounts listed here are meant to be recommendations. Feel free to adjust proportions based on what you have on hand and personal preference. Using a 4-5 quart Dutch oven or similar pot, heat 1-2 tbsp. olive oil and saute fennel for 2-3 minutes. Add garlic, then washed and thinly sliced kale. Cover and cook the kale-fennel mixture, stirring occasionally, until the kale softens, about 5 minutes. Add diced carrots, bay leaf, herbs and broth, adjust heat to medium-high and bring to a gentle boil. 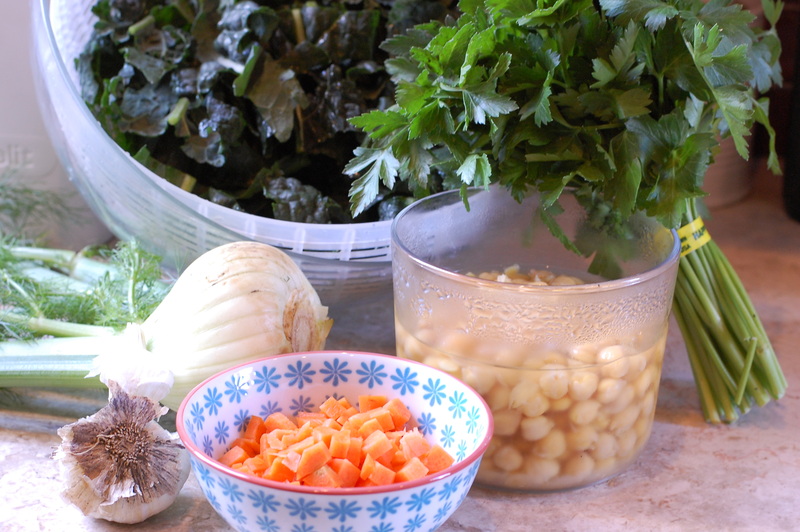 Once at a boil, turn down the heat to allow the soup to simmer for 25-30 minutes until the kale is tender and wilted. A few minutes before the soup is done, add in the cooked chicken and garbanzo beans to warm up. Remove from heat, then add in a squeeze of lemon juice if desired, along with salt and pepper to taste. Serve as is or throw in some croutons, rice or pasta for a heartier version. Don’t forget to save some leftovers for lunch! « Older Post Roasted Cauliflower with Capers and Anchovies	» Newer Post What are you making for Thanksgiving this year?